The Best Western Chaffey International Motor Inn is ideally located in the center of Mildura. Come and experience our hotel near the major tourist attractions. Best price guaranteed and exclusive deals. 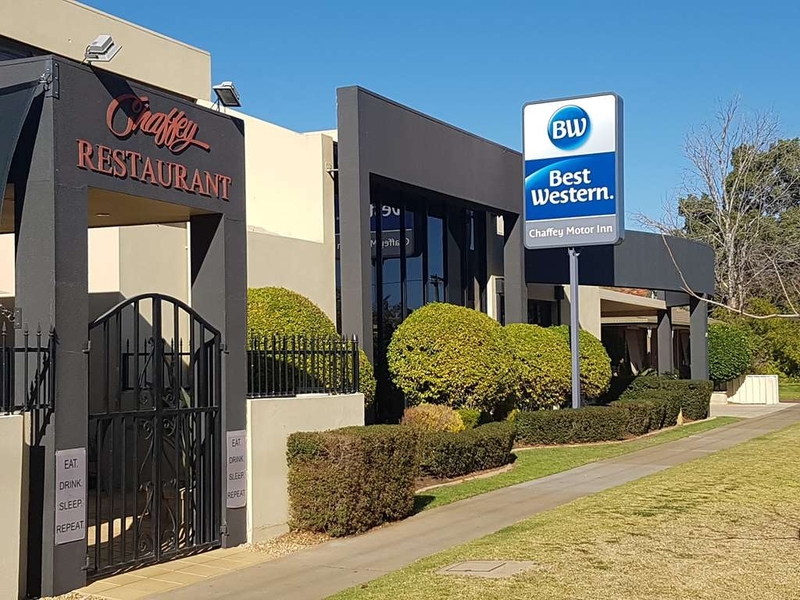 Ideally located to allow easy access to Mildura City and the beautiful Murray River, Best Western Chaffey International is the perfect choice for a relaxing holiday or for a quick stopover. 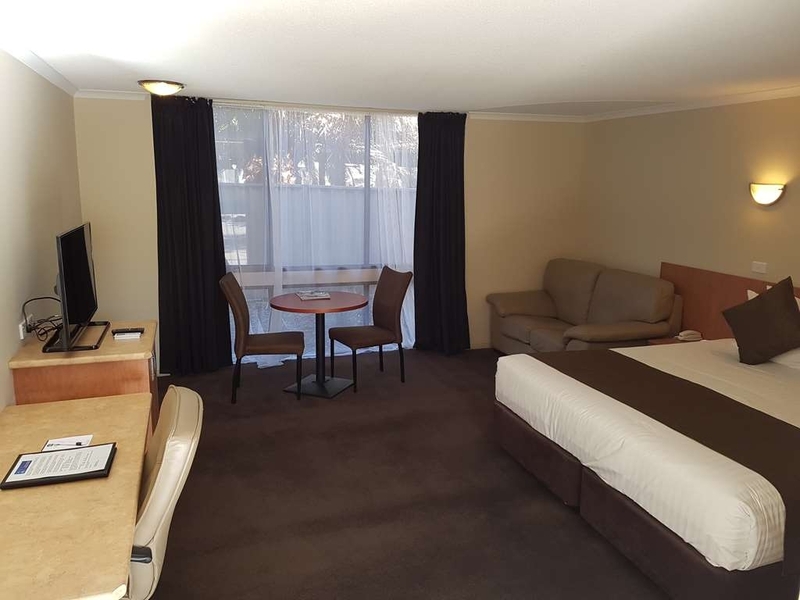 Whether you are a business traveller, a family, a group or a couple on a romantic getaway, Best Western Chaffey provides the most convenient, comfortable and affordable accommodation Mildura has to offer. Mildura is Australia’s grape and wine tasting country and home to many world-class wineries, orchards as well as ample opportunities for outdoor activities such as kayaking, fishing and canoeing. 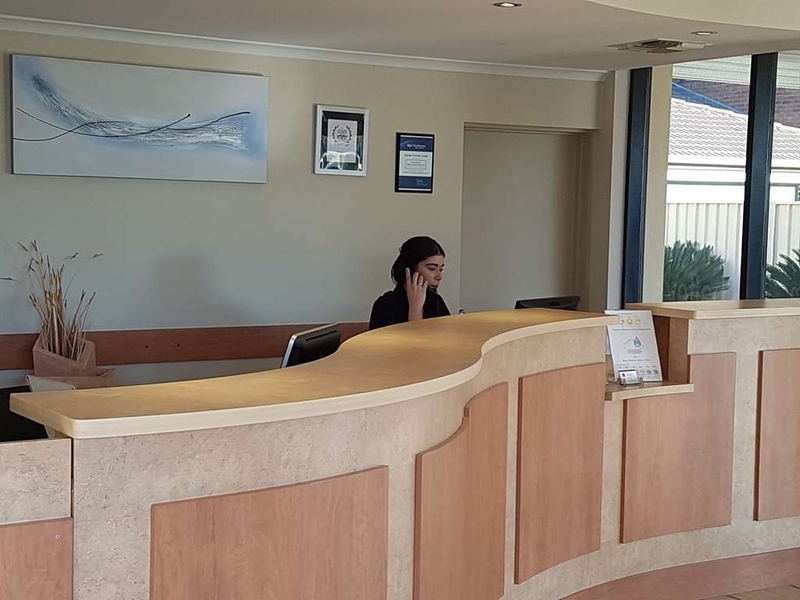 At Best Western Chaffey International Motor Inn, we cater for travellers of all types with the best amenities they can expect from Mildura motels. We offer luxury spa rooms, two bedroom apartments as well as well-appointed suites to suit different preferences and requirements. Each suite is equipped with large screen TV’s, Foxtel, complimentary Wi-Fi and king sized pillow top beds. Visitors can also enjoy the resort style swimming pool and some quiet time in the al fresco area. Let’s not forget about Happy Hour daily and the delicious meals at the Chaffey Restaurant, open for breakfast and dinner, 7 days a week! If you are looking for things to do in Mildura, you can visit the Mildura Visitor and Information Center which is just a five minute walk from the Best Western Chaffey Motor Inn. The highly experienced motel staff can also provide assistance on exploring the many attractions in Mildura. 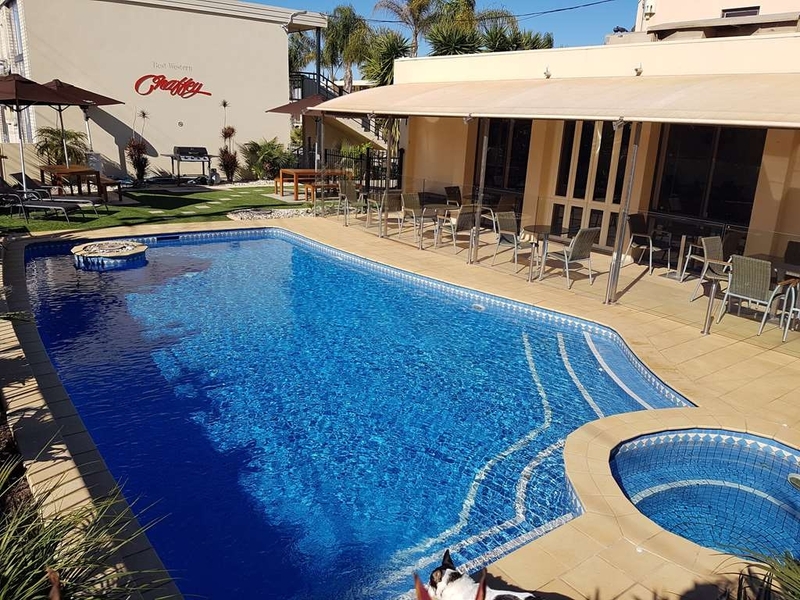 Whether you are passing through the beautiful Sunraysia Region or on a getaway to Mildura to try its incredible wines, there is no better Mildura accommodation option for you than the Best Western Chaffey Motor Inn. 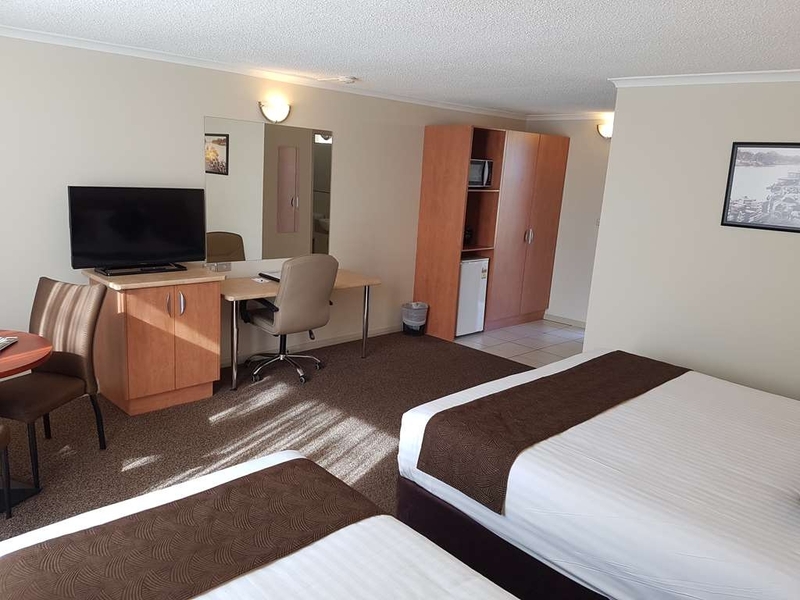 If you are on the lookout for Mildura motels with all the right amenities and a convenient location, book a suite at the Best Western Chaffey Motor Inn on your next visit to Mildura. We chose the Chaffey hoping it would be hot and we could utilize their pool. It wasn't hot enough but we did think it looked nice and clean and had good seating for those not swimming. With the bar right there it would be easy to enjoy a cool drink while watching friends in the pool. We did use the restaurant and had a great meal. There was a bus tour in so we chose to eat later. When we arrived fresh cool water was being placed on our table. The rooms were lively. We had a king superior upstairs. I usually don't like having to climb stairs with bags but these stairs are wide and not steep. The beds were so comfortable and the bathroom was big and clean. We ordered room service breakfast which was lovely and so reasonably priced. We would definitely stay here again. Driving to Adelaide again and stayed here on the way there and on the way back. As before was a great place to stay. The rooms are spacious, clean and well decorated. Beds are comfortable with choices of pillows...........great pillows. Love the place, will stay here every time as it is value for money, comfortable and makes you feel welcome. An asset to Mildura. Thanks for the lovely stay. "Lovely accomodation and meal "
We booked a king suite and we were upgraded to a spa suite which was lovely, thank you. A very generous sized room, huge really, as was the bathroom and the spa area. Outdoor table and chairs was also a nice option although too hot for our visit. Air con was on, so thoughtful! Love being able to back the car up to the door when we are travelling. Pool looked lovely. Highly recommend staying here, well worth the little bit extra. Very good, comfortable rooms and beds. Very clean rooms. AC worked good- which is useful in hot Mildura. Nice pool. The breakfast was just wonderful, the eggs Florentine delicious. We would stay there again. "Very good service and wonderful room"
Book in to book out was excellent. Restaurant service was very good and the staff were helpful and went out of their way to make us feel comfortable and looked after. Good wine recommendations and food suggestions. The room was large, comfortable and the bathroom was clean and spacious. Good facilities and tea and coffee. Room was very big with lounge and table and chairs. Bed was extra comfortable . Room was very clean and quiet. Wi fi was very slow even though l read it had just been up graded . Car parking is very tight . Walking distance to shopping centre and food outlets; but a bit of a drive into city centre and also riverside. Clean and neat cabins. Good size. Just good, simple, honest accommodation. Staff helpful. "We stayed here twice. On the way to Adelaide and on our return trip. The motel is great and we enjoyed our stays." The rooms (we had two different rooms), very clean with comfortable bed, good pillows, lovely thick white towels and a good mini bar set up. We ate breakfast in the restaurant and enjoyed our breakfast very much although the serving size was very generous! The staff were friendly and very helpful. Would definitely stay there again and recommend this motel to others. Very central location and easy to locate. Great value. First time we stayed here. We had a short stay as we had a quick family event. Room was fabulous, quiet and it was a lovely touch to have bbn our heating on for our arrival. We totally enjoyed the breakfast and wish we had dinner the night before. Will stay again next time we are in Mildura. If you like walking this motel is ideally located for an easy walk to the river, shops and eateries. The restaurant serves great food here and the bar is great. Has a happy hour from 5 PM. Parking for the car is easy and the room is comfortable and roomy. 3 of us in a comfortable room- loved the bed. Friendly staff too. Spend the extra and get breakfast in their restaurant- cooked as well as buffet, it was a great start to our day. Would stay again and have breakfast! I stay in Mildura often, but this was my first stay at Chaffey's. I've eaten here regularly, and the food is fabulous. Staying added another dimension of enjoyment to the experience. Ben and Melinda go out of their way to be welcoming, warm and very hospitable. The room was BIG, very well set up, and very clean. The bed, incredibly comfortable. We were at the back of the complex and there was no road noise. I hope to stay again soon. Thanks for everything Melinda. In Mildura for business and stayed where my staff stay at the Chaffey! Rooms large and comfortable, towels 5 star, rooms clean and the restaurant is first class! Ben & Melinda ate friendly hosts who make sure you have an enjoyable stay! We didn't choose to stay at this hotel ourselves. We ended up in Mildura by accident when our car broke down and were booked in here by our insurance company. What a pleasant surprise it was !. The room was very spacious indeed with a little private courtyard. There was a mini bar and a spacious bathroom which was a little dated but very clean. The hairdryer could do with an update, it was one of those old wall mounted ones that's a waste of time. The bed was comfortable but the rooms are not very soundproofed and we could hear somebody watching TV at 5am. There is a pool area on site. The restaurant is excellent, we had a fabulous meal there and were served by the lovely Rachel. All the staff were friendly and helpful. I would happily stay here again. "Pleasantly Clean and Surprisingly Quiet Accommodation"
Easy to find just in town with easy parking and good size room with a great shower. A comfortable bed and a good air con. Our room was on the second floor so up one flight of steps but still very easy access from the car park with the wide external stairs. The room and the hotel was quiet and there is a pool and restaurant though we did not have time to use either on our short overnight stop on our way to Adelaide. Check-in was fast with very pleasant staff, our room was very nice and we enjoyed afternoon drinks at the bar. Dinner in the restaurant was excellent, as was breakfast. Parking was a breeze, right next to the stairs to our room. Plenty of parking is available. Amazing room with a lot of space if you are in a manual wheelchair or have a member with a four wheel walking frame. The beds was so comfortable. Great staff really willing to help nothing is to big or small. 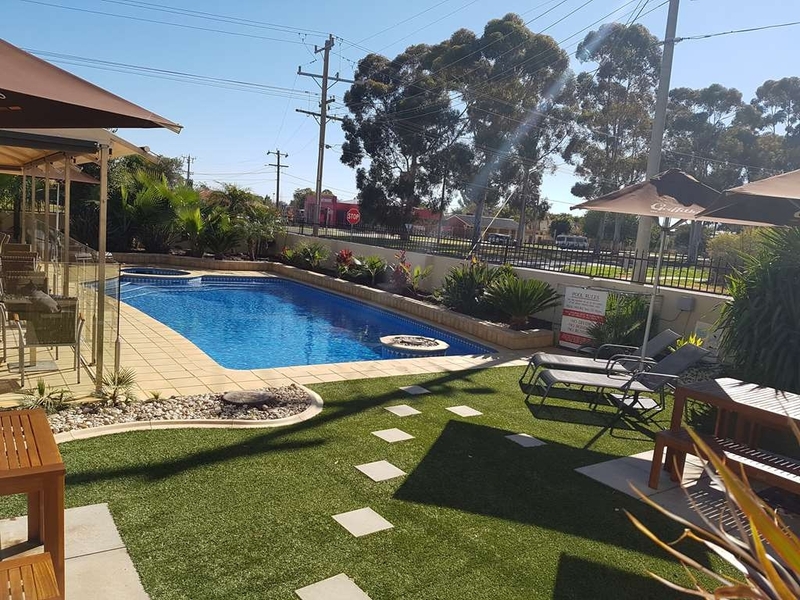 "Clean convenient and comfortable "
Having Been to Mildura on a few occasions we seem to have missed this place in the past, looking for something different we picked this place and were not disappointed. 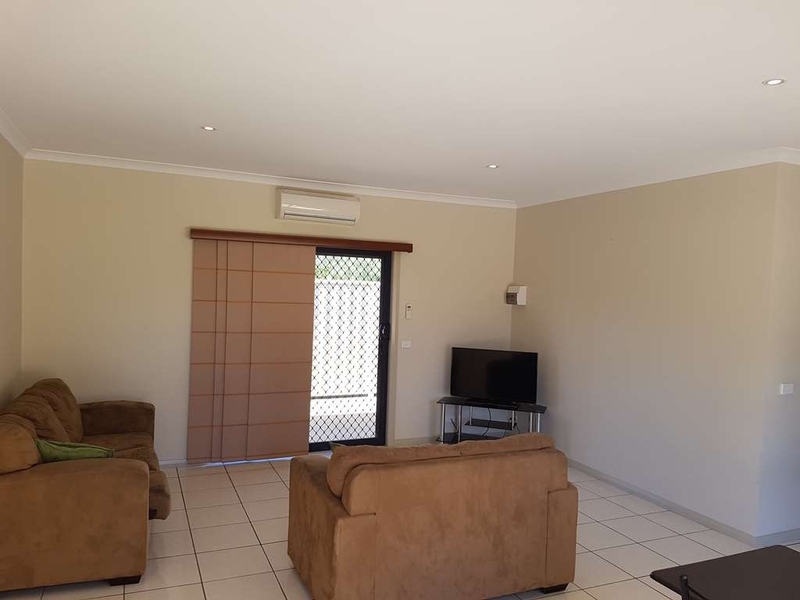 Not quite in the heart of Mildura but situated on the Main Street it's still located a short 15-20 min walk to most of the popular restaurants. The service was good, the rooms were modern spacious and well appointed with a very comfortable bed. Despite being on a main road it was very quiet and peaceful. There is a restaurant located on the site and had we not committed to something else that night we would have eaten there as it looked pretty good Overall a very pleasant experience at a very reasonable price, should we travel through here again we will stay here. We stayed 4 nights while having a mini break from kids and work. The motel is not in the centre of town but it is an easy drive to the Centro Plaza, town and the river; and Big Rooster is across the road. Unfortunately this visit we didn't eat in the restaurant as we were out most of the time. The room was reasonably large and the bed was super comfortable; plus the air conditioner coped well with the summer temperature - hence I can highly recommend the comfortable bed. Pool area was nice to sit around and have a couple of relaxing drinks though didnt go for a swim. One most advantageoous benifit was a guest washing machine which was great seeing we were there fore a few days. Quiet too as you cannot hear any road noise as all rooms are away from the main road. We stayed here for one night while traveling from the west, fantastic accommodation. Clean, neat, spacious with two separate bedrooms and the best shower all trip. Will certainly stay here again on the way back. Highly recommended! I always stay here while in Mildura, because everything is so well done ,but this time they went above and beyond. My work colleges and I didn't finish a job until after 11.30 and didn't arrive at the motel until 12.15, but they opened the doors for us, still with a smile on there face , excellent work guys. The continental breakfast is still great. Would highly recommend. We stayed 2 nights while visiting Mildura. This motel is not in the centre of town but it is an easy drive to the river, shops etc. We didn't eat in the restaurant. The room was large and comfortable and the air con coped well with the very hot temperatures. There was a nice (small) pool. THere was a guest washing machine which was helpful. Recently my husband and I stayed at BW Chaffey and found it to be a wonderful experience. From the moment of checkin the staff were helpful and friendly. Our room was large and very cool, which was appreciated as the outside temperature was extreme when we arrived. The bed was very welcoming and the large fluffy bath towels wonderful. The manicured gardens and the pool are a feature. We ate in the restuarant a few times and my husbands favourite dish was the hand made Ravioli, he had it twice during our stay. We would stay here again and recommend it to our friends. We have not stayed at a lot of country motels and were pleasantly surprised. Clean, spacious rooms and a shower with great volume and pressure, all for a very reasonable price. Would definitely stay there again. "A place you must stay at!" My partner visted this Best Western 10 years ago and would non stop talk about this place when we did the drive from Perth to Sydney to Mildura. So on our way to way back to Perth we stayed one night, being my first time, manicured gardens amazing! !, swimming pool looked really welcoming and beautiful, the room was hotel standard, just fantastic! Loved how they thought about amenties, most places don't give you body cream or shower gel or wifi but they thought about it. Thank you so much! Will definitely recommend you and will hopefully visit again in the near future :) Also they have a restaurant and shops just walking distance such as KFC & a mini supermarket. We stayed at the Chaffey over Christmas for 5 nights in a 2 bedroom apartment. I can highly recommend it for cleanliness, space and amenities. Also very quiet as the rooms are ood the main road. We had a brilliant stay. Restaurant lovely food for breakfast and dinner. The pool is clean and well set up with tables and sun loungers. We will definitely be back! Thank you. Couldn't be happier with the choice to stay here, the size of the unit was amazing and aircons already on cooling the rooms. Fantastic kitchenette and added bonus of a private courtyard with it's own clothes line. The unit has a washer and dryer which is very handy and great water pressure in the shower. We were delighted to find the motor inn offered a computer and printer for guests to use and whilst we did not swim the pool looked very inviting! Can't speak highly enough of the Chaffey International Motor Inn our family were very impressed! With age comes wisdom, well sort of. But we have learnt that unlike when we were in our 20s, 30s & 40s we can't drive nonstop from Sydney to Adelaide in one day. We found the Best Western last year by chance and plan to use it every trip to and from Adelaide in the future. The rooms are now all fitted with king beds. The facilities have been upgraded and the offered service is excellent. The dinner serves are typical country, larger than city restaurants. The breakfast was up to international standards for offered choices and priced very reasonably. The owners and their staff are again typically country people who will do all they can to make your stay comfortable. This stay we were in a 1st floor room and it was easy to get up the stairs due to the gradual rise steps. Parking is better than many motels that we have stayed at this year, while driving around Australia. Recently stayed for a few nights. Owners are exceptionally helpful and do their absolute best to make your stay comfortable. The room, whilst it is older style, is spacious and incredibly clean. The bed was easily the most comfortable I've experienced in a motel. Bathroom is older style, but again clean and more than sufficient in size and water pressure. Room service for dinner was great - slightly on the expensive side, albeit fresh, tasty and a good sized serving. Would recommend and return. "Certainly a good place to stay"
Two nights in Mildura made convenient and comfortable by staying in the Chaffey. Nothing much to say other than that really. Efficient and certainly better than other places we've tried in the town. Not too taken with breakfast, but in fairness, we didn't try much as it was a quick getaway morning. "One of the really great Motels"
We stayed here and were pleasantly surprised with the attentive staff from the outset. We travelled as part of a large group (44) and 4 staff met our coach and whisked the bags to the reception area, then accompanied us to the room. We stayed 3 nights, used the Restaurant for breakfast and Dinner and found the meals to be of the highest standard. The rooms were spotlessly clean, well and tastefully appointed, beds super comfortable and best of all, virtually soundproof. Ground floor units had a private rear courtyard. The pool was a little on the cool side but t this time of year, that is to be expected and it didn't detract from my hours swim. Clean and quiet motel with two bedroom family unit. Small but clean and comfortable. Great to have a washing machine and dryer in the room along with self contained kitchen. We were able to park right outside the room. Staff are friendly and welcoming. Stayed at the Chaffey recently for four nights. Rachel on reception is delightful, happy and helpful. I appreciated the room service after working all day the kitchen staff do an awesome job the food was fresh and hot. Check out the size of the chicken snitzel!! Nice porterhouse too. The over sized room was quiet, spotless and fresh it was great for work and rest. Bonus mini bar in room with heaps of goodies. Yes the beds are amazing with a range of different pillows. The bathroom amenities shampoo, shower cap, shoe cleaner where appreciated. Stay a night just for the beds !! This motel is really excellent. My large room was spotlessly clean and very well equipped. He bed was one of the most comfortable I have ever slept in. The air conditioning was quiet and effective. I could park outside my room. Staff members I met were all helpful and efficient. I can highly recommend the restaurant, where I had both dinner and breakfast. I would be surprised if there is better accomodation in Mildura than this motel. Friendly welcome at reception. We had a large room downstairs which was clean. Comfortable bed, clean sheets, great towels and a good shower. In room dining available. What else does one need! Obviously popular as the car park was full. Cheerful welcome. Beautifully clean and spacious rom. Excellent bathroom facilities and shower, very comfortable king sized bed. Toaster and microwave in room.Cosy restaurant with good food and pleasant efficient staff. Very good value for money,will stay again. "Spacious and very comfortable "
The rooms here are large, immaculately clean and well equipped. The wifi had a strong signal and the staff were all pleasant and helpful. Very good value for money and would definitely stay here again. Stayed one night on business and had a very comfortable nights sleep. The king bed rivalled my bed at home for softness and comfort. I noticed the clever advertising next morning - a flyer next to the bed stating if you liked the bed you can take it home with you, with details of the maker, price and range available, even quoting delivery costs Australia wide! I'll be following up on that one when next I need a new bed! Otherwise the motel was clean and well presented with a restaurant on site and close to the CBD. "A very professionally run motel, with attentive and helpful staff." I travel a lot and have spent over 30 years in the tourism industry, so it takes a lot to impress me. This property managed to do so in every way. It's well run and pays close attention to the needs of each individual guest. Every staff member was friendly and helpful. It's well equipped and maintained. The menu is diverse and the food, which is of good quality is well prepared and presented. First time staying in Mildura for business. This fine establishment were nothing but wonderful to me during the visit. As I have mentioned in previous reviews, it's the small things that count. Internet was magnificent, Foxtel was spot on, food quality amazing and something as small as having enough tea , coffee and towels was quite refreshing. Kudos to your fine establishment. Had a lovely night stay here thanks. Very comfortable and clean. Great shower pressure! Heater worked well and most importantly and the best was a comfy bef and had a good sleep. Or that was the alcohol. Either way...... nice place. I stayed here on a recent business trip to Mildura. This hotel is about 1.2km to the main part of town. It's an easy walk as everything is flat or you can drive, ample parking everywhere. The hotel room is huge and I appreciated that you could open the window for fresh air. The wifi was strong and there was a large desk. The bed was extremely comfortable and the toiletries were goid quality. If you want to have breakfast onsite it is reasonably priced and includes a coffee. Overall a very comfortable stay. I just had a great overnight stay at the BW Chaffey International. Firstly the room was spacious, modern and smelt amazing. The bed! OMG the bed! It was the comfiest bed I've slept in for the longest time, pillows were very comfy as well. We dined in the restaurant, food was heaven and then finished off the evening with a cocktail in the bar. 10/10 for room, food, price and conversation with the managers! PS Cooked breakfast hit the spot as well. One of the best value motels we stayed in on our recent two week road trip through Victoria, SA snd NSW. Large, well maintained, clean and modern rooms. Excellent on-site restaurant for dinner and breakfast. Great wine list. Friendly and helpful staff. Would not hesitate to recommend this motel to anyone staying in Mildura. Mildura Best Western Chaffey Motor Inn is located on Deakin Ave , a relatively convenient location from City central . Around 5 minutes by driving. Staffs are very friendly. Room is quite clean , bed is very comfortable. Great value for money! Highly recommended! Have to comment on how friendly the team were here. We'd been on the road all day and nothing was a problem from check in to check out. Room was clean and modern, and my porterhouse steak for dinner was perfect. Well done team. A great place to stay, handily close to the main road into town. There is a very good restaurant and bar, the rooms are clean, quiet and well equipped and the staff are capable and friendly. Second floor rooms are accessed by stairs but are generally quieter. "Great hotel choice whiles in Mildura"
"One of the Best in Mildura, and I have stayed in most of them over the years!!" As a rep I have stayed in a number of hotels in Mildura over the years. This hotel has large and very clean & well maintained rooms, restaurant changes their menu a number of times over the year not like some of the others up here. If your a rep, value for money and if your lucky as Ben or Melinda for the special. If you wish to stay here I would seriously book in up to 2 weeks early as this hotel is becoming more popular and sometimes had to get a room. Over all just a great place to say in The Riverland. Good restaurant manages gluten free meals, room is ok, clean and tidy with all that is required. Good bed and shower. Venue is quiet, prefer a downstairs room. They differentailly price ground level and first floor rooms with ground more expensive. We found this interesting, reason given was parking access and not having to climb stairs. We managed a special rate, online listed rate very high for location and facilities. "A great spot for a stopover"
We stopped here in both directions on our trip. Rooms are large and have everything you need in a hotel room. They are off the road so were quiet. We had dinner in the restaurant one night which was actually quite good. Also had room service breakfast which was quite reasonably priced. Would stay there again. "Top Motel in The Riverland !!" Recently enjoyed three nights at this motel. Very clean, comfortable bed, terrific hosts who are friendly and helpful. Parking is on site although not always available right outside the room if on the ground floor. Highly recommended motel in a town with a lot of alternative places to stay. "Very adequate place to stay in Mildura"
Although it seems to be a little old fashioned or dated, this is a great place to stay. Parking is directly out front of rooms but you may have to park a few spaces away due to people upstairs parking too. The room was a twin and had King and single beds which were comfortable. The room had the usual amenities - kettle, cups, glasses, tea, coffee, toiletries, iron and full sized ironing board and a mini bar. The room was large and plenty of room. Also had a bench with TV and table and chairs. Bathroom has a shower, no bath. All very clean, quiet and comfortable. Unfortunately didn't have time to try their restaurant but next time. There are lots of places to stay in Mildura and this is a good choice. This has to be one of the best motels in Victoria. The proprietors of Ben and Mellisa are just so helpful and friendly. Rooms are quite luxurious with king size beds. The restaurant has a great menu and seems to change every time we go there. Would recommend any visitors to Mildura to make this their accommodation venue. Motel is quite nice. Be careful your room is what you booked and is not dated. Had to upgrade to get the quality room we thought we had booked, another $40 per night. Not offered a discount. Not offered seniors discount. Could be better so look around. Be sure to put your towels on the floor if you want them changed. Room servicing not good, okay but not good. Location is okay but a little closer to river and CBD would be possibly better for the money. Staff were helpful but the upgrade could have been gratis even if for only one if the two nights. I would look around. "Spotlessly clean generous rooms, friendly service, quiet location "
This country hotel deserves it's high ranking. It is well run and the accommodation is excellent. Don't expect glitz and unnecessary trimmings, just plain great accommodation and a relaxing holiday or business stay. The Deluxe room we have booked is of a very decent size. Excellent kingsize super comfy bed, a sitting area with couch, dinning table and chairs. They provide crockery and cutlery as well as a cattle and toaster, so you can prepare breakfast in the comfort of your room. The other option is to have a very nice brekky at the restaurant at a very reasonable price. There is a rather small open air swimming pool, so don't expect to do your daily laps there, just a refreshing "dip". We have also had dinner twice and were very happy with the food, as well as the lovely service. Review of the restaurant in a separate blog. PS Note that the location of the hotel is approx 1.5 km from the mall and some 2 km away from the Murray river. So if you don't came by car some walking should be taken into your considerations. This country hotel deserves it's high ranking. It is well run and the accommodation is excellent. Don't expect glitz and unnecessary trimmings, just plain great accommodation and a relaxing holiday or business stay. The Deluxe room we have booked is of a very decent size. Excellent kingsize super comfy bed, a sitting area with couch, dinning table and chairs. They provide crockery and cutlery as well as a cattle and toaster, so you can prepare breakfast in the comfort of your room. The other option is to have a very nice brekky at the restaurant at a very reasonable price. There is a rather small open air swimming pool, so don't expect to do your daily laps there, just a refreshing "dip". We have also had dinner twice and were very happy with the food, as well as the lovely service. Review of the restaurant in a separate blog. PS Note that the location of the hotel is approx 1.5 km from the mall and some 2 km away from the Murray river. So if you don't came by car some walking should be taken into your considerations. "Lovely place to stay, friendly staff"
This is a very confortably hotel, room (deluxe) was large enough for an overnight stop, spotlessly clean and decorated tastefully. We had dinner outside next to the pool, very relaxing area with tropical plants. The staff were very helpful and friendly and the food was very good (the menu was a bit unusual) I have no complaints with this place at all. "Best Western Chaffey Motor Inn"
The Best Western Chaffey Motor Inn is in a good location not too far from the Murray River and restaurants. It is very clean and well maintained. The rooms are well presented and very comfortable. Has its own restaurant and bar. It is worth a stay and reasonably priced. "Easy check-in and great room-service meal." Pre-booked so easy check-in. Great value overnight stop. Room large, comfortable bed and good bathroom. Had room service meal and it was wonderful. Veg. side was all I felt like and it was THE BEST VEG SIDE. My husband's steak was also terrific. What's not to like! The layout of the rooms here is very traditional for Australian motels. However the size is above the average. The room was clean and with a particularly comfortable bed. The only seating available was an eating table and chairs. We always rate the provision of a comfortable armchair very highly in hotel and motel accommodation. 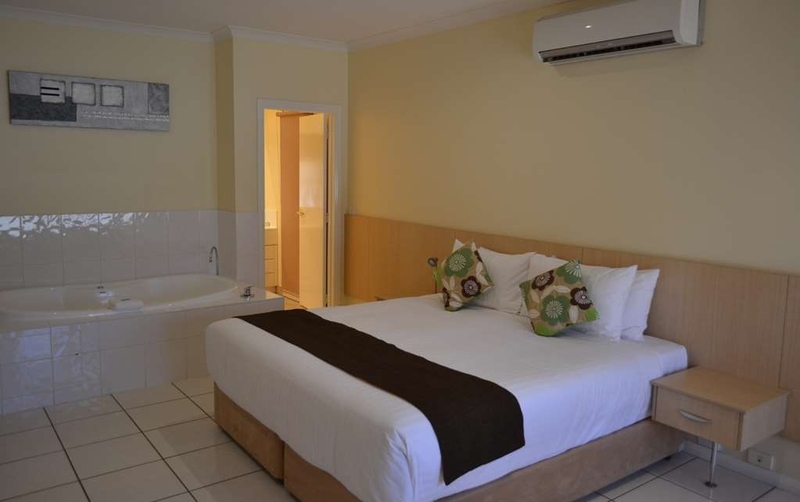 The motel is located on the main road into Mildura and about 10 – 15 minutes walk into the shopping and restaurant area. Don't stay here if you have piercings or tattoos. I observed a woman putting down a young lady obviously applying for a job who had some piercings and tattoos. I was disgusted at this woman's behaviour. Ugly were the words used. This young lady left calmly, unsure how as I would have ripped the person a new one. No wonder people harm themselves over petty comments made to the appearance. The woman should learn that beauty is on the inside, but you madam, have no beauty, and have lost a customer, and a bloody regular one at that. I will be telling everyone of my experience. "Rude management who do not care about guests"
I was shocked and appalled by the complete lack of care and concern we were shown during a violent storm that caused a total blackout during our stay. We were not offered any help or information and had to go out to buy our own candles and a lighter! The rain came in under our door and flooded the tiled floor, it also leaked through the windows onto the carpet. I called the reception in the morning, when the power came back on and was apalled by the attitude of the manager who showed no concern, offered no help or compensation and said "it's not our fault!" Bed - excellently comfortable. DInner - well, we were feeling a trifle off-colour and couldn't finish it (and that's nothing to do with the Chaffey - we'd contracted something untoward on the way there), so we went without breakfast, too. Wifi is free and secure (not common, I've found), and we received some unexpected advice about avoiding goats en route to Broken Hill, our next stop. Wise words indeed - the goats hang about the roadside and take off across the road as you approach. No goat was harmed in preparing this report, I'm glad to say, though our nerves and skill at avoiding erratic living obstacles were tested. Excellent room, large space, comfortable bed clean and modern. 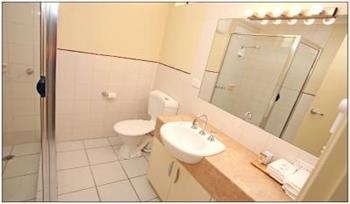 Good size bathroom would recommend for short and long stays. Will definitely stay here on my next trip to Mildura. Rooms are quiet with little to no street noise. We stayed there after long driving day. Young girl at reception waited for us till after 10. Room is clean, nice and BED!! Best sleep I had for long time. Their bed and pillows are as good as you get at Sofitel hotel, highly recommend to stay there! This hotel is lovely. We had a large room, clean and quiet, very comfortable king sized bed. Nice 2 seater sofa, reverse cycle air conditioning, tea and coffee facilities with milk, toaster, and mini bar. 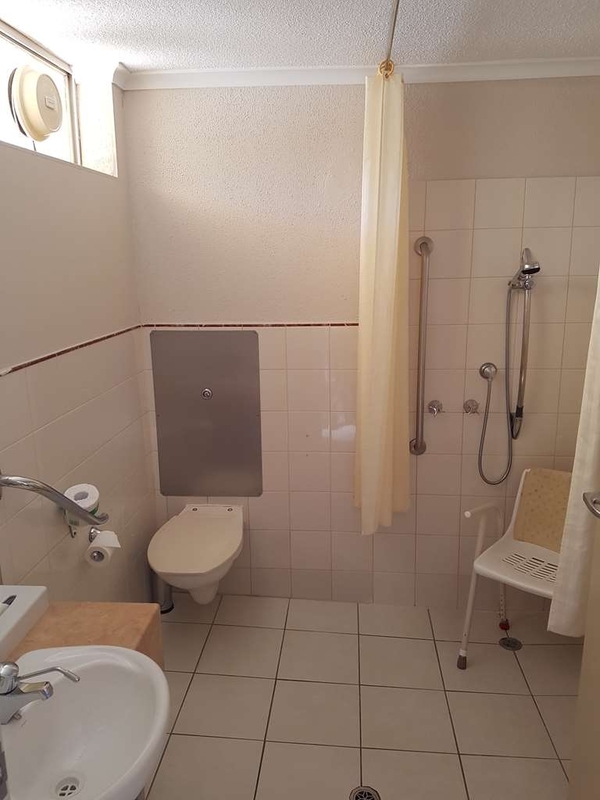 Lovely bathroom with free bathroom products, large bath towels. Very helpful staff. Solo visit to Mildura, booked through Webjet because of an offer. No real complaints, room was pleasant. Super comfortable bed! The rugby was even on TV. First trip to Mildura, but would happily stay here again if I'm in Mildura again, or suggest it to others. "Good clean motel - only 5 minutes out"
Good clean motel - only 5 minutes out from centre of town. Rooms good quality and quite large- staff friendly and accomodating. Great for stop over - recommended - worth a stay - reasonably good value! Mine was a solo over night stay. The check in person was friendly and helpful. I found my room to be a spacious well furnished, Very clean. The bed to be very comfortable. Breakfast was a treat. Convenient location. Will be staying again on my next trip. Tucked away behind it's subtle frontage is some spacious and well kept rooms , the bed is great , the bathroom huge, there is the usual kettle but also toaster , wine glasses, plates, bowls and cutlery. The grounds our well kept and as much as there seems to be a lot of people staying its very quiet. Didn't try the restaurant but it looks very nice ???? We paid just over $100 for a king room with full cooked breakfast included, very good value these days. The room was very spacious with a large lounge and round dining table, still leaving ample room to walk around things. They went to great lengths to make sure we knew the bed and bedding had been fully renewed in the last year, with top quality replacements. Both the bed and pillows are outstanding, very high quality. The bathroom has been recently renovated to a very good standard. The only downfall was breakfast. The standard of the food was adequate at best. Food was undercooked and luke warm. Staff were pleasant and attentive but dressed as though they were having a lazy day around home, far from professional. Most had a variety of ill fitting and old looking clothes, one spilled water on her top and continued to serve with most of her top soaked through. An establishment such as this that has obviously put money into the rooms should spend a little more on professionally outfitting their staff or insisting on far higher standards. Accommodated on the second floor as requested, the bed and pillows was so comfortable and the room was clean. Bathroom amenities are complete for what I need. Stayed here only for 2 nights but amazed that they changed our linens and towels and vacuum the carpet. The place was right for our comfort. The breakfast was included and which the intercontinental was included in a la carte breakfast. Left the place contented. "A bit old and drab"
Like so many motels in country areas, this place is past its best. The reception and front of house area has been done up but the rooms, while spacious, are very basic. Bed is comfortable enough but the bathrooms need a complete overhaul. Enjoyed our four-night stay, very comfortable room, extremely comfy bed, spacious room, very clean. Fantastic breakfast too. Great value, we would definitely return and highly recommend the accommodation and the friendly staff. Short drive to wherever we needed to go. We booked the Deluxe King Room located on the 1st floor and were not disappointed. It's a little away from the centre of town but unless you took a bus to Mildura, getting to the centre is only a 2 minute drive and we did prefer the quiet of the area. We didn't hear any road traffic at all - just the occassional flush of a toilet, but you hear that in most hotels. The room was comfortable, spacious, clean, had all the right toiletries and if I am not mistaken, was recently renovated in the last year. Wi-fi is free and speed wasn't an issue. We had breakfast included and whilst we didn't order huge meals, we found them to be delicious, plentiful and effort had gone into their prepration. It wasn't a boring motel meal. What was probably more important was the friendliness of the owners/staff. The past reviews here helped us make the right choice. This was probably our favourite place we stayed at on our 2 week trip out west - and we did stay at other establishments that were far more expensive. This motel is not far from the Main Street. The room was very clean, a little dated but a good size. Was surprisingly quiet being on the main road into Mildura. Good to see a few extras like bowls and plates. Our room was terrific value for money - clean, spacious, modern and comfortable. The main street is about 1.5km away (and most restaurants are in the main part of town). But we enjoyed our 15 min walk after sitting in a car for 8 hours! The hotel has a restaurant if you prefer something close. Only small negative is that WiFi is a bit slow. We will definitely stay here next time we pass through Mildura. Lovely quiet, clean, comfortable room, with a superb bed. It's a couple of km's walk into town if you are keen. Staff are lovely, breakfast was excellent, would definitely recommend to others, and possibly stay again if I am ever in Mildura again. Stayed here a couple of months prior and once again was not disappointed staying for a couple of nights again, walking distance to town and the restaurants but just as nice to eat in at their restaurant, everything was great only complaint was a couple of our main pasta dishes were a bit cold but we think that it was due to them being held until everything else was ready. Lovely breakfasts as well. Cheery staff. "Comfortable motel with good service"
The Best Western Chaffey is fairly average motel, the rooms show their age a little but it is comfortable. The front-office service is excellent but I wasn't very impressed by the restaurant. While they tried to make an interesting menu, none of the meals we ordered were really worth the effort. By all means, a good place to stay but dine elsewhere. "Nice spot to stay ..."
Stayed in the deluxe suite with spa and it was very comfortable and clean. Parking outside room and back off the street. The motel is a short distance from the main town (drive short with walk a little longer) but everything is reasonably close for what you may need. Stayed just 1 night for work & was very happy with the hotel. I booked ahead & check in was very easy. The room was clean & very spacious for 1 person & would fit a family in easy. The pool area is very pretty, but no good for winter. I ordered room service & had to wait about 30minutes. The eye fillet was amazing. Melt in your mouth steak & a very generous serving. Overall a very comfy motel & would definitely recommend. Room was nice and spacious and most importantly looked and felt clean. Room was located on the ground floor and was able to just drive up. Check in staff were helpful and the restaurant serves really good food. Breakfast was cooked fresh and really tasty. Unlike many hotels, Wi-Fi actually worked really well and didn't drop out. We stayed one night on the way to Clare Valley. Booked the breakfast special for an additional $10.00 each & had any choice from the menu continental and cooked -great value. The room had good quality bed, towels & toiletries. We ate in the restaurant that evening and had a delightful meal. Our hostess was very happy to chat in the evening & following morning over breakfast. Came away feeling we had a very pleasant stay & great value for money. "BW Chaffey International Motor Inn"
Excellent service, great value for your buck, quiet and peaceful location in Mildura Vic. Rooms spacious and some have Spa's. Excellent breakfast menu, and very efficient in value. Ample car parking (as I had a tandem trailer) to park up, this was achieved without any disruption to other clientel. Currently having a great stay at the Best Western Chaffey International Motor Inn in Mildura. After a long day of driving, we were able to check in promptly. The room is spotless, and very comfortable. Great location in Mildura. "Midpoint stop - 3 states in 1 day trip"
Stopped in Mildura and break the trip from Sydney to Adelaide. A convenient location, with good size rooms, king bed, and free wifi. The hotel was located right on the highway, so it wasn't hard to find and the front office staff were very friendly and helpful. After the Hay plains, a good hotel with great service helped rejuvenate us for the final leg of our driving tour. I stayed here for business. My room was very clean with a very comfortable pillow top bed. Had a great sleep. The room was a great size. The bathroom had a great shower with good size shower rose and great pressure. Nice towels and products. Heating and cooling was good. Good size TV. Would definitely stay again. Stayed two nights and thank goodness I drove the extra hours to make it for two nights. Clean, comfortable, well maintained and luxurious for the price and so will definitely be on my stay list next trip to Mildura. "Excellent 2 night stay - best Best Western I've stayed at!" This hotel was above the normal Best Western standard - great quality beds and up to date decor. Great pressure in shower and well stocked mini-bar. I also ordered room service here which was great. Even the toiletries were better than the standard best western. Plenty of parks available. Located on a main road there was a bit of road noise from my room but I was in the room closest to the road really. Hot food at breakfast time is made to order. The location of this hotel is not far from town although without a car it would still be a bit of a walk to the main shopping area. Stayed here as part of a long road trip and found it to be very pleasant. It's close to the main part of town, the room we were in was large and the bed very comfortable. It's a large motel and there's plenty of off-street parking. $135 per night was very good value. Staff were friendly and welcoming. We stayed here for one night on our way to Broken Hill, we had booked in elsewhere, reading on TripAdvisor we decided to stay here! We were not disappointed, our room was on ground floor, extremely clean, our bed was very comfortable as other trip advisors have commented on. Our evening meal at the hotel was good, nothing to complain about. Finding a comfortable hotel bed is like finding a needle in a haystack. But I kind it here my first stay about a year ago. It's great not to have to look at other motels and try to decide where to stay. Great sleep. Every time. Plus friendly service, great rates and everything else you could want. "Northern Exposure - Mildura & Region"
Our room was a king deluxe on the first floor, accessed by a set of stairs. The room was large and fully refurbished. A comfortable king bed with crisp bedding, table & chairs, settee, writing desk and wardrobe to hang your clothes. Foxtel on tv and free wifi provided. The airconditing was very effective and quietly warmed the room. The motel is located close to the river and centre of town and although on the main road little traffic noise is heard at night. Would not hesitate to stay there again. Stayed for 4 nights with no issues at all. Friendly staff and very attentive when needed. Our room was spacious and quiet with limited outside noise. A good location a little way out of the CBD with a pleasant walk to the tourist information centre and nearby shops. Will stay again. 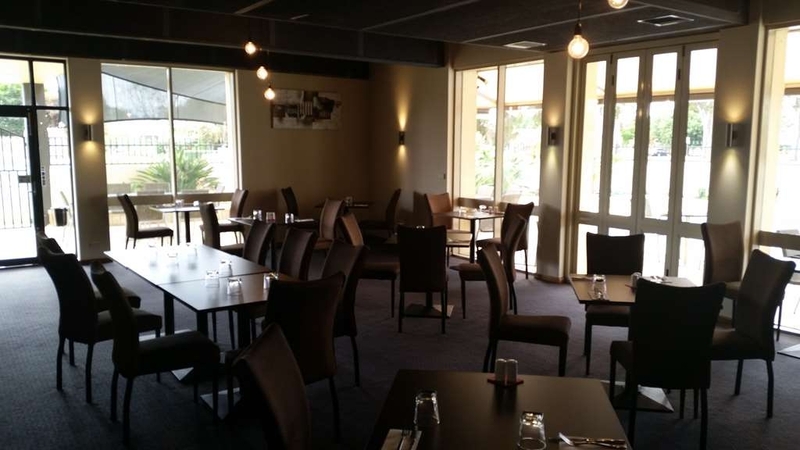 "Mildura - Great motel to to use a base location for the area. All staff and amenities great, friendly, clean." Quality of establishment was excellent, greeting on arrival and departure was great, this include staff working around the premises through out the morning. Was pleasure to stay here. The bar of soap provided was a of a size where you could hang onto it, not one of the very small bars usually provided at a motel. "Good location, clean, great wifi, good amenities"
Finding family rooms is not always easy regardless of where you go, we were very happy to land one that ticked all the boxes upon arrival including reasonably priced! We didn't plan to spend a lot of time in the room, but you know how things go sometimes ... The only downside to this was the neighbours were a bit noisy at times however this should not reflect negatively upon the motel. The apartment had everything you would need when you were away from home including a washing machine and (I think) a dryer! Not a must for me (honestly I think they ruin holidays), but there is a good size TV and a necessity for keeping up with news, weather and of course sport - but most of us have smart phones these days anyway! Wifi is fantastic!!! Water pressure was great as was the hot water service. The apartment was clean and the beds were comfortable. We had breakfast in the restaurant and all staff were polite and friendly - I have no idea why other people have commented otherwise! Close proximity to most things that Mildura has to offer! "The Beds are Delightful! " I stayed here for one night, around 3 weeks ago. 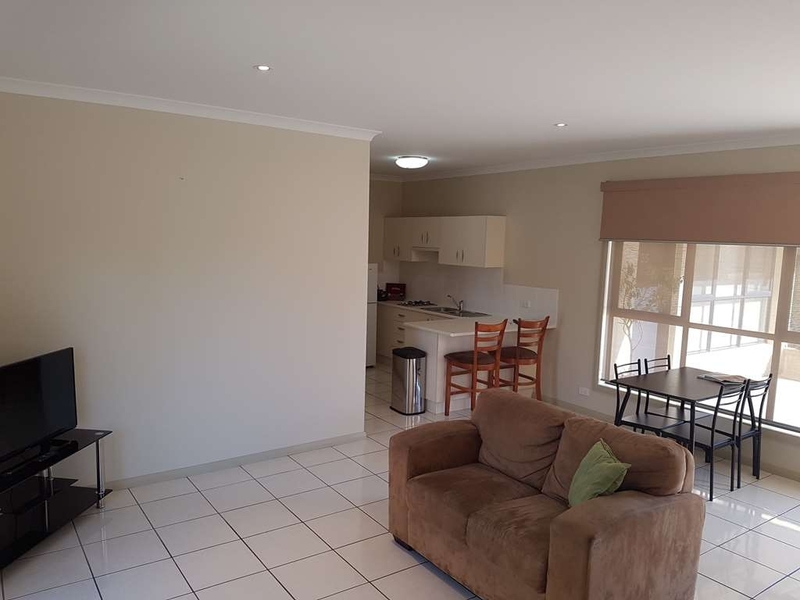 Although the reception staff/owners aren't the most friendly compared to other accommodation options in Mildura, their rooms are more than adequate for a night or two. When I checked in, I noticed they had a small dog in the office, which was really off-putting as I have quite bad animal allergies, however, there was no proof the dog had been in any rooms, so don't let this deter you. The room was large, clean, amenities were standard and mini bar also fairly standard. The windows in the room didn't have the best seal (a tad noisy although it didn't bother me). The best thing about the room and my reason for a 5 star review was the bed! One of the most comfortable beds I have slept in, up there with the beds at The Sofitel in Melbourne. Soft yet supportive, the mattress was divine. Room service was swift, although the pasta was undercooked. The flavour of the sauce was quite good (roast duck with masala wine) although the pasta itself was not enjoyable... They got 5 stars for the bed, without it, I'd have given a below average review on this establishment. "Deserve the high praise on TripAdvisor"
Stayed the night here as part of the Black Dog ride to Alice Springs. My room was Executive room # 8 (very quiet as I am further away from the road). Room was clean and have everything you could want. Bed comfortable. Only down side was having the split system air con/heater right above the bed. As vents cannot be adjusted far enough, warm air blow on you directly when sitting in bed. The highlight for me was their restaurant. I make it a habit never to eat at the 'motel attached restaurant' but this one was an exception. I had Chicken Parma and it was a proper chicken breast (generous portion too) and tasty. We were in. A. Group of 12+ people but they managed to bring everyone's plates out at the same time. People are friendly too. What more could you ask for when you are traveling? Highly recommended! "Quite, clean and friendly motel"
arrived to a very polite, efficient check in service. Room was well away from noise, very clean, comfortable bed and relatively modern. short drive from Coles and Woolworths and centre of town. they do offer a restaurant and bar, but I did not use them but will in future. We found our accommodation very comfortable, lovely and clean and modern. Happy to recommend this to anyone travelling to mildura, its rates are very reasonable. If there were any complaints, it would be the teas and coffees were not replenished, but that is nit picking. Would definitely stay again. Comfy beds, clean linen and good central position. I stayed 3 nights on business and I must say this is some of the best service I have ever received. Nothing was ever to much trouble for staff and they were all just so friendly. The food was beautiful and room service was very quick. I would definitely stay again especially if I was with my family. Highly recommended if you appreciate good old fashion customer service. Stayed here a couple of weeks ago and had a wonderful experience! The Chaffey motel and their restaurant was one of our top favourite nights during our 4,300 kilometre road trip. The room was extremely comfortable and perfectly clean. We chose to eat at their restaurant for dinner that night and breakfast the next morning. And so glad we did. The ambience was relaxing and the food was cooked to perfection. I definitely recommend this motel. We'll certainly return to this motel on future trips. Stayed here for a week during school holidays. Had a family room with lots of space. Very clean and modern. Ate twice in the restaurant and it was really good. Ine of the nicest places to eat in mildura!!! A noisy location with tricky parking bays. Very tired both inside and out but clean as a whistle. Good for passing through for a night. Wifi is free but so slow it's rather pointless even bothering. Reasonably priced at $99 pn. I certainly wouldn't pay anymore than that. Didn't seem to be well patronised - perhaps that's because the main street is absolutely full of hotel choices. We'll be coming back this way but will try somewhere else next time. Car noise outside the room alone is enough to stop me from returning. If you're a light sleeper this place is not for you. Our room was large, clean, and very comfortable bed. We found the Staff very helpful. Because of our age and usual ailments that go with it,we were a little worried that our room would be upstairs but were so happy when we were told they had found one on the ground floor. The A/C was on when we arrived adding to our comfort. When we booked we included buffet breakfast which we found wonderful, cooked just the way we wanted it with added extras such as yogurt, fresh fruit, fruit drinks (as well as tea or coffee) cereal etc. Mildura is one of our favourite places to visit - a must go place. "excellent value , great service"
We stayed here in March. It seems that the site was recently taken over by new ? owners ? managers. The room was spotless and the king sized bed wonderfully comfortable. After a series of one night stops it was great to have access to a laundry with pay washing machine but free dryer. It was much better value than some other equivalent motels we stayed at . very clean and we had a great meal in the restaurant served with very friendly staff. Walking distance to city center and clubs and the Murray river is a great attraction with the paddle steamers. We went on a lunch cruise to Trenton Estate winery and it was terrific value for money. "Very good motel in Mildura"
I spent a night in Mildura while travelling around Victoria. I chose the Chaffey Motor Inn on line because of the room size and location. I expected a functional motel room for the price but this was much more. My room was very spacious, well maintained and quiet (room are behind the reception and restaurant block and therefore away from the road). The bed was comfortable and the linen and towels newish. The little extras that one would like in motels and sometimes gets were there - free wifi (fast and reliable) and 8 channels of pay tv. The location is a few blocks from the centre of town but that means it is quiet. If you have mobility problems or heavy bags then ask for a ground floor room because about half of the rooms are on the first floor. Overall, I was very pleased with this motel and would happily stay there again. We stayed here last night, on a very brief visit to Mildura on our way to Sydney. We had a king size room, upstairs at the back of the motel. A very comfortable bed, the room and ensuite were clean and obviously well looked after. A warm friendly guy on reception welcomed and far welled us. Very good value for money. "from 2 nights to 3 nights"
First thing you notice is the friendly staff at reception, the rooms are very spacious and clean , the restaurant cooks a mean char grilled steak and the buffet breakfast is great , only thing I didn't like was the mattress, it was comfortable , I just like a firmer mattress. We were upgraded to a spa suite with complementary wifi. The room was spacious, right at the back of the motel on the ground floor so nice and quiet. The spa was wonderful after seven hours of driving and the bed was very comfortable. The only issue was we had to rewash the breakfast bowls before using them, but this was no big deal. We stayed here over the busy Easter weekend and was pleasantly surprised. The room was large, clean and comfortable and the service great - couldn't have asked for more at the price! Considering just about every room was booked it was very quiet too. "A very good comfortable motel"
On the main road from Wentworth, one of many motels. This is a 2 storey affair. We had a large upstairs room with a big comfy bed, a sofa, table and chairs and a smattering of plates, cups and glasses. The bathroom was decent but it had taps the wrong way round which for creatures of habit can be a problem. The shower and toiletries were good but the handle of the shower broke apart in my hand. The restaurant was surprisingly good. We had lovely tasty red snapper but the mixed veg were well over cooked. One big negative health wise was that there was a plate of food remains, including a fish head were left outside of next door's room all night. They have a pleasant swimming pool, smallish and a little too cold but All the same worth using. "Amazing experience for a short holiday"
On arriving reception was friendly and helpful. We entered our motel room and was welcomed to a beautiful 22C, given that it was 40C+ day this was a wonderful relief. Our room was clean, modern and spacious and the bed was absolutely amazing, so very comfortable. The pool area was surrounded by lovely gardens and the pool was clean, we enjoyed our time in the pool given the high temperatures. The restaurant was truly amazing with modern décor and reception was very welcoming, both mornings that we stayed we were treated to two amazing breakfast's, both cooked and continental breakfast's offered plus barista styled coffee's/tea's. We recommend when booking your accommodation that you pay for your breakfast online as it is offered at a great discount rate. The owners and the cleaning staff make you feel very welcome every time you walk past, friendly welcoming comments, always asking if they can do anything to make your stay more enjoyable! This establishment is an A+ by any standard's!! "Easy to find, easy to check in, lovely comfy bed"
Staying for 1 night. Looking forward to trying the restaurant. Can already say it has been very easy to check in, sit down, relax and get organised for the next drive. And oooo the lovely pillow top king size bed - yes! Would definitely stay here again. "Clean, Modern, and Great Service"
Super comfy bed, fast internet, good food. No complaints at all! I was able to relax after a very long day driving to Mildura. Despite being very full it was extremely quiet. Parking was a breeze as well. 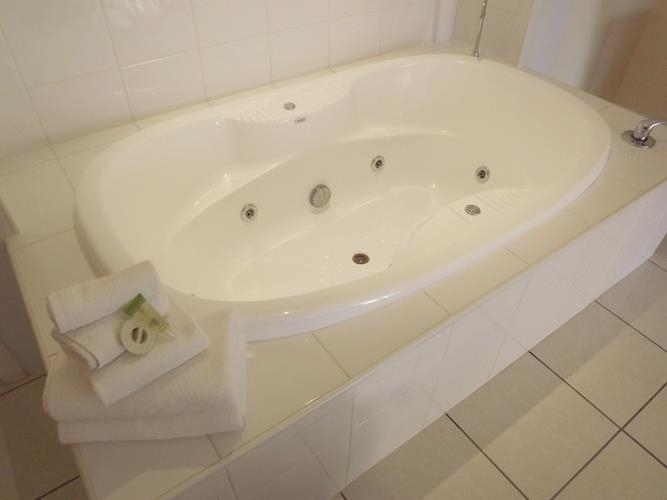 "Wonderful place to stay in Mildura"
We stayed in a ground floor spa suite. The staff were very welcoming and judging by the full car park we picked a popular place. Fabulous new king bed and beautiful linen. Spacious and very clean. Would definitely stay here again. "Just what the Dr ordered"
With a last minute rush to Mildura for a few days, we really couldn't have picked a better place to stay. The staff were just so lovely. The BED!!!! OMG if it fit in my car I would have taken it home. the room was lovely and clean and we were informed that it is now under new management, they are changing little things every day. A bit of a touch up of paint wouldn't go astray in the bathroom but that is the only thing I could say was wrong. Breakfast was lovely, we didn't get a swim in the pool, but its just set up to relax. Thank you so much. You made a few very stressful days better. "Refurbished Hotel , well worth considering"
"Holiday away for the wife and i"
What a great stay we have just had, the new owners were very friendly and helpful, the rooms are very clean and a very comfy bed. When we booked there was a special on breakfast what an absolute bargain good choice of hot breakfast all cooked fresh and a good size, set us up well for the day. new owners very friendly motel having cosmetic changes for the best, nice size flat screen TV plus some cable channels, great size new bed really comfortable, nice quality sheets and towels .We didn't try the restaurant but if the changes they have already made are anything to go by it will be a winner. My partner and I stopped off here for two nights in feb. We were lucky enough to get an upgrade after arriving and were placed on the bottom floor, Our room was very large clean and looked newly renovated The bed was comfy and paired with my bamboo pillow resulted with two nights of very deep sleep Staff were very helpful and were happy to answer any of our questions about mildura And the food from there restaurant was beautiful Highly recommend this place!!!! This was a great place to stay in Mildura, everything you could expect. Clean, large sized rooms, wifi, restaurant has a modern look with great food and not a bad walk to the main strip. Would highly recommend. This was a great place to stay in Mildura. Well air conditioned rooms and a sparkling swimming pool to cool off. The king size bed was very comfortable and the room spacious with a small lounge and table. As we stayed for three nights all these factors made for a very comfortable stay. We have travelled to Mildura in December/January for the past 5 Years. We have stayed at a number of different places and this is a great place to stay. We had a ground floor unit in the corner with parking out the front. The room was a king which was large very clean and had everything you could want. A large spa and the best double shower we have been in. It has a happy hour in the bar every day and the restaurant was very good with reasonable prices. Great out door area around the pool area where we sat and enjoyed a number of drinks. The only thing was that there were no music speakers in the out door area which would have been good. Great Service and Great Staff. "Surprise Gem with seriously good in-house restaurant!" Having travelled from SA, and on the return leg of a round-trip to Sydney for work (with my 7 year old daughter opting to come along for the journey), we booked a king room (with single bed also), based on the reviews of other 'Trip Advisors'. I was SO IMPRESSED! Yes, it's a 'motor-inn'... but all reservations can be left at the door. All the essentials for a good night are here. SUPER comfortable beds, sparkling clean rooms, well-stocked mini-bar for a quick refreshment.However, most importantly, the loveliest hospitality I have experienced in years. From the moment we checked in at reception, we were greeted with such genuine warmth. This hospitality carried through to the wonderful dinner. I took my daughter 'out' to celebrate our trip, and there was literally not an aspect missing. GREAT food, interesting wine list (with suggestions, and 'back stories' about the wine explained), and lovely service. Generally, motel restaurants are not the first choice, but often the 'easiest' choice after a day of travelling. This is NOT the case here. I am seriously considering bringing the family back for an overnight stay. The complete experience was that lovely. "Fantastic place to stay, best kept secret in Mildura"
We visit Mildura every January and booked 2 rooms for 8th and 9th of January 2016. We booked king rooms and must say the rooms were really nice, the beds were just awesome. We also had breakfast there and the quality and presentation of the food was fantastic. Mildura experienced a power black out whilst we were there and we couldn't believe that even with that challenge, breakfast was served perfectly with a smile ! I travel a lot and would highly recommend to anyone wanting to stay in Mildura to not go past Best Western Chaffey Motor Inn. You will not be disappointed!! Thanks to Ben and Melinda for really making us welcome with a smile , we will defiantly be staying there again when we come to Mildura. "A tough place to beat." 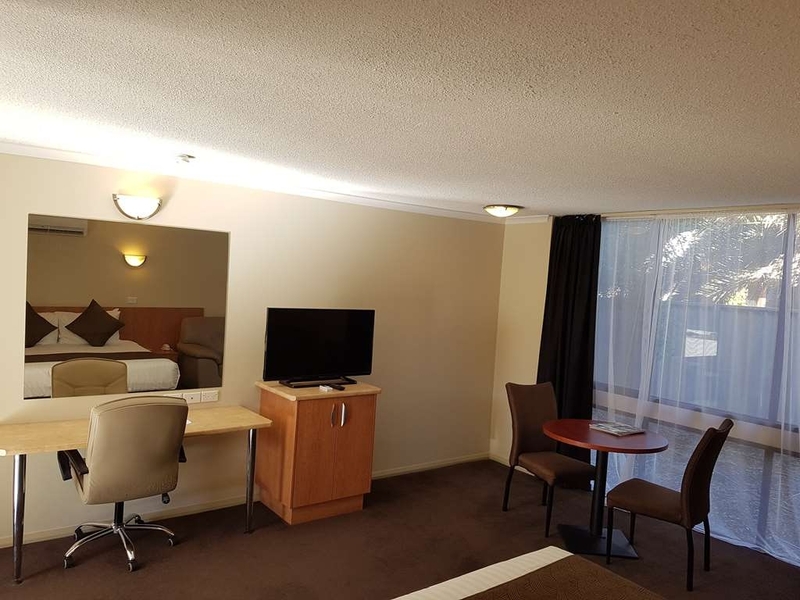 My family and I decided to spend a day in Mildura in our travels across Australia and pre-booked the Chaffey International Motor Inn based on previous reviews. Little did we know how good it was going to be. We decided to stay in a room with a king size bed and spa. The quality and level of luxury in the room is just as good as places that cost twice as much, for example, resorts in Airlie beach and townhouses in Torino. The bed is the most comfortable we have slept in for quite some time, the bathroom and spa are quite spacious and there was plenty of room for our four month child and all the extras that accompany him. The restaurant was fabulous, with generous portions at a reasonable price, with a strong emphasis on making as much as possible in-house. For breakfast there was even a real coffee machine so no-one had to be subjected to instant coffee. This thing that set this place above all others was the service from the staff. They were always willing and eager to do what was necessary to enhance your stay, even when the power was out for a whole morning they were keeping guests informed and persisted with breakfast and lunch service. Overall, this place is a hidden gem with luxury and service to exceed anyone's expectations, in a fantastic small town with plenty to see. I highly recommend this for anyone looking to stay in Mildura and I look forward to traveling through there again. We drove a long distance and we were exhausted. This motel is centrally located in small town. The staffs were very friendly. The room was large and clean. The bed was perfect. Wi-Fi and car park are free. I would stay there again. We had x2 spa suites with outdoor patio areas, great rooms – very roomy, clean and cool given the extreme temperatures during our stay. This is in an excellent location, easy to get to everything and a short taxi ride into the main precinct if you choose to have a few drinks with dinner. Excellent service and amenities – give it a try I am sure you will be impressed. "Nice rooms - brilliant restaurant!" I arrived on a 44c day to find the room very cool with the air-con on. Room service dinner was a complete knock-out - diverse menu, very well cooked (beetroot salad with steak that was perfectly cooked) and great value. Stayed here for a few days over Christmas. lovely clean pool, fantastic big breakfasts were a great start to the day..Melinda.. ill miss your coffees and Braydan misses Ben's pancakes!!! ?Rooms are very clean, huge comfortable bed. Thanks Ben and Melinda for making us feel so welcomed. We will definitely be back. All the best for 2016!!! We took a spa room. Numbner 37. The room was very large and wonderfully quiet. The rooms are set behind the main block that encompasses reception and the restaurant so are away from the main street. The expansive size of the room coupled with the very generous spa room and large bathroom and shower was a pleasant surprise. All fitting were spotless and in very good condition. A most imrtant factor is of course always the mattress and pillows. These were exceptional. A pet hate of mine is room doors that are brutally strong in closing. These wonderful doors were without auto-closing so moving luggage in and out was easy. What a relief. Parking was immediately outside the door so no need to carry the luggage far. The airconditioning was very effective - which is important here where 40 degree plus days are common. The spa filled quickly and water quality and temperature were good. There is a pleasant little paved area at the back of the room., very private and with large umbrella. A pleasant place to sit and read. The pool was sparkling clean. we did not dine in for dinner, but the breakfast was excellent. The bacon was perfect, the eggs very fresh and a range of fresh cereals and juices made for a great start to the day. best of all the coffee was barista quality from a great new machine. I cannot compliment the staff and the facilities enough. I know that this is an agricultural area with exceptionally good foods available from which to conjur the meals, but full marks to the staff. Being not local we had been hesitant about what to expect. But our stay was wonderful. I cannot suggest a single improvement. I am sure that anyone choosing to stay here will be delighted. We have used this motel in the past and saw the establishment getting a bit tired. But, what a huge improvement seen when we visited on the 26th November this year. The new owners who took over January have really turned this motel into a 'hot spot' to stay. Spacious clean rooms, friendly service, easy parking in a quite location and the restaurant is a treat with a menu for all tastes. The wine list is equal to many fine restaurants found today. OVER PRICED _ TOLD By the other place we had to stay when for some reason when we arrived in to check in they were closed. Could not get a hold of them later discovered some issue with the phone system. Either way long drive and had to find somewhere else to stay THAT ASIDE its not all bad comfortable location everything was good. SPA in the same room as bed MEH I could leave that. Mildura is a topps place to stay and i would probably try this place again but has room for improvement for the price. "On entering room we noticed filthy airconditioner"
It troubles me when you pay for a motel room and find filth and by that I mean uncleaned room air-conditioner , so obvious when the exterior body is covered in dust and dirt , yes it's 6 foot up on a wall , but why shouldn't the motel have a cleaning protocol to ensure room hygiene and customer health & safety . Approached hotel with complaint only to be advised that the room aircon was due to be cleaned next week ? Get that ? They cleaned filters with vacuum ? Get that ?, no idea how to clean . Know how to charge but no responsibility to service room . Located a short distance from central Mildura, we were allocated a recently renovated room, which was spacious and well appointed. Parking was easy and the location relatively quiet. The motel's restaurant was a convenient and excellent choice for dinner (separately reviewed). After and evening outing, a restful night was spent in a large double-king bed. Very happy with this motel and recommend it. We were booked for 2 nights at Best Western Chaffey but extended to 3 as the road to Mungo National Park was closed and we were delayed for 24 hours. The staff were very good about keeping our room for us while we worked out what we were going to do. Overall the staff were very friendly and helpful. The room was what you would expect from a Best Western motel - clean, comfortable. Although the motel is on the main road from Melbourne, the rooms are behind the reception/dining building and we did not experience any problems with noise. We enjoyed the use of the swimming pool which, while small, was very clean. The location is convenient to the main dining and tourist areas - we were able to use our bicycles to access these areas. I had stayed in this hotel some years ago and it was not great but, the new management really have straightened the placxe out! The rooms are very well appointed and functional for either holiday or business. Veyr clean, good bathroom facilities and a truly excellent, comfortable bed. The restaurant food was very good too and presents very good value for money. Service level is efficient and very friendly and the location is very good too. All round and very good choice for anyone planning atrip to Mildura. Stayed 3 nights, had a great room (23) on the first floor, great bed, t.v. air con, shower, and spacious room. Very clean Parking is anywhere, but there is plenty of parking spaces. We had a toaster in the room, plates, knives and forks etc. Iron in room, and washing machine below for $3.00 per load with a free dryer. Swimming pool was excellent. Also had a couple of drinks there (there is a happy hour where you can try various boutique type beers) Also had a meal in the restaurant and that was also very very good, at a reasonable price. Service was excellent. Definitely stay there again if and when we get back to Mildura. "Clean, Comfy and friendly staff"
The rooms have been updated recently, there are comfy new king size beds and was very clean. There was also also good free wifi. The breakfast at the motel was great with good coffee. The staff were friendly and great with our 3 year old toddler too. We would definitely stay here again. Nice spacious, comfortable room and bed. Quiet surrounds, would stay again. Situated on the main drag and shops not far away. Staff very friendly and helpful with ideas on places to go see and things to do as well as good places to eat. The new management is putting in a big effort to upgrade facilities and provide superb service. The room was one of the best we've stayed in for a long time - spacious, new carpet, clean, and a super comfy king size bed with fresh, clean sheets. The air con was quiet and kept the room at the perfect temperature. We had free access to pay TV and wifi (which worked really well). The pool was sparkling clean, although a bit cool for me (even though it was 35 degs outside). In summer it will be perfect. They even supply pool towels so you don't even need to byo. We didn't try the restaurant but it looked attractive, with al fresco dining available next to the pool. The motel is a few hundred metres from the information centre, and about a 20 minute walk into the delights of Mildura and the river. Staff were really friendly and helpful. Thank you Ben and Melinda for a lovely stay. Thank you Ben and Melinda for friendly and professional service. Dinner was exceptional for a motel restaurant - perfectly char-grilled steak. It was so good, we had to stay another night on our return trip. "Best most comfy bed! - King size"
"New (very friendly) Management, very comfortable beds"
Stayed here for 3 nights. The room was very comfortable and the new mattress was fantastic. The motel is well located and the pool area looked very good. They could add some lounging chairs to the lawn area to make it more comfortable! Would definitely stay here again. "Nice Place, far away from home." It was my first visit to Best Western in Mildura. The staff are welcoming and friendly at the front desk. The room was large, very clean and tidy and fully air conditioning. The noise level very low. The price very reasonable. A++ I would revisit the hotel in my next visit to the town and do hesitate to recommend it to other visitors. My husband and I have just had a return visit to the Chaffey International Motor Inn and it looks fantastic.. The new Managers have been very busy since our last trip in February! The gardens are looking great and the yard is nice and tidy. Quite a number of the rooms have been renovated, painted and carpeted and they look amazing. Again my husband and I loved the crisp sheets and comfy bed! We ate in the restaurant a few times and the food was great!.... and the choice on the menu is extensive! I recommend any visitors to try the Chaffey, you wont be disappointed! We rang ahead and booked a room as travelling from Adelaide to NSW in the afternoon and from first point of contact to the end we had great services. We were going to arrive late and this was not issue as check in until 10pm and we arrived at 8.30pm. Check in was easy and the room was great. Our air con was already on and was nice to enter the room already cool. The bed was super comfortable and had a great shower. This was great after a day drive and a big drive the next day. Very quite and had a good sleep. Room had good facilities with lounge and table and chairs, kettle and toaster and good bath products. Friendly staff at check out in the morning too. Had no issues and would recommend. Will stay again on our next visit. Great hotel and great service. Recently under new management so they are upgrading rooms. New king size beds are so comfortable and had a great night sleep. Office staff are very helpful. Will stay there again next time we are in Mildura.Highly recommend. High-quality accommodation and facilities, including a fast internet, and a very good restaurant. We only used the motel for overnight stop on a journey from Adelaide to New South Wales but would definitely recommend it for longer stays in Mildura. A very nice hotel overall. great location, secure, neat and very comfortable. WiFi was quick and free as it should always be. Staff polite. Well priced rooms, we had two of them, one upstairs and the one downstairs had a spa. The room was spacious, clean, the bed very comfortable, the bathroom adequate. A pleasant stay was enjoyed by my husband and myself. Restaurant had a nice lay out, enjoyed the food and wine, professional staff. "Coffee made by the Boss"
"Good hotel for short visit"
A good sized room with an excellent bed. The managers were helpful and made arrangements for us to store our bikes safely; we appreciated this help. The motel is about a 10/15 minute walk from the main shops but only a couple of minutes by car. Certainly well priced and a good place to stay.